Our highly esteemed customer base can avail from us a premium quality range of Laxmi Pagla with Swastik. The products are designed as per the latest trends. The products are valued in the industry for their premium finish and vibrant colors. We are a brand highly acknowledged for the superior quality and affordable pricing. We are manufacturer and exporter of Traditional Brass Crucifix. This is a solid brass nickle plated enamel color cross with corpus. The beautiful embossing is entirely done by hand. It comes with a felt bottom. With the support of trained personnel, we have been able to present high quality Ganesha Kumkum Box. We are one of the most reliable companies in this domain and are into offering Acrylic Shubh Labh. Hanuman Gada - size available 1 inch and 1. 5 inches. energy pours inside when you look into gada. Sphatika gada made of pure sphatika, crystal quartz crystal. - Enhance the decor value of the temple, house, office, hotel, etc. Great for gifting during weddings, anniversaries, house warming ceremonies, new venture, award ceremonies etc. Uses-self use, return gifts in marriage, baby showers , birthdays, coorporate gift, mehendi function, sangeet..etc. Bring in the presence of SaiBaba on your car dashboard or office table with this metallic statue. Detailed gold work makes it very attractive. Writing Ganesha Gift is a beautiful unique artistic decorating piece. It is perfect showcase of Indian handicrafts that brings prosperity and good luck. 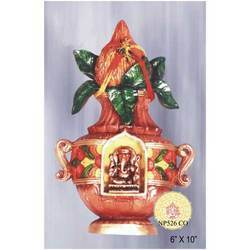 We are manufacturer and supplier of ganesha ceramic. swastic ganesha gift item. It is a metal ganesha for the purpose of gift . Our esteemed customers can avail the premium range of Silver Kamakshi Lamp from us. The statues are quite popular in the global market for their innovative designs and precision finish. We are a brand widely recommended for offering the high quality products in the market.